Given the name because of their penchant for hiding in cellars, the Gophers formed in the 1890s and went on to rule the West Side between Ninth and Eleventh Avenues around 42nd Street through the 00’s and teens. Their main target: the New York Central Rail Yards, which ran up the far West Side. One Lung Curran, Happy Jack Mulraney (who always looked like he was smiling but supposedly had some kind of facial paralysis), Stumpy Malarkey, and Goo Goo Knox. Gang leaders back then had some colorful names. 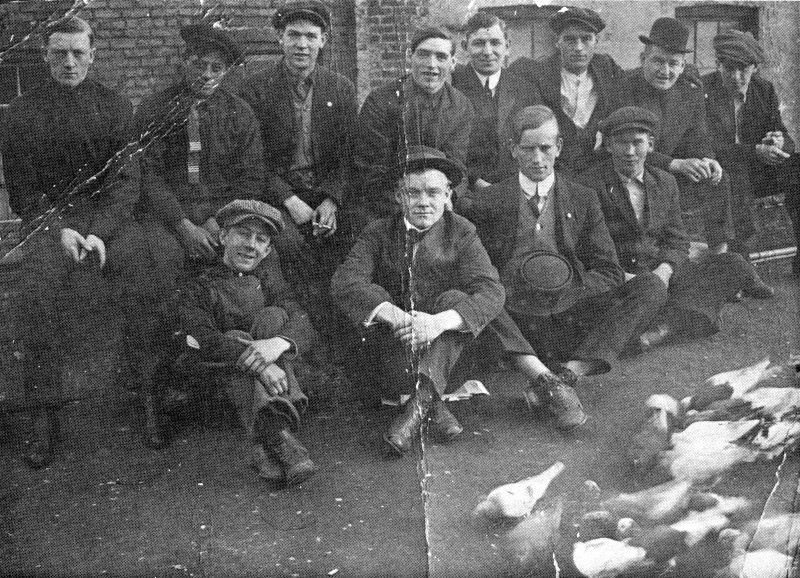 UK-born Owney Madden, fourth from left in this 1910 gang photo, earned a rep as one of the most brutal Gopher leaders. Nicknamed The Killer, he’s responsible for numerous deaths of other gang members, especially from the rival Hudson Dusters. After serving time in Sing Sing, he became a bootlegger and co-owner the Cotton Club, Harlem’s flashy club in the 1920s. This entry was posted on August 22, 2009 at 5:42 pm and is filed under Disasters and crimes, Hell's Kitchen. You can follow any responses to this entry through the RSS 2.0 feed. You can leave a response, or trackback from your own site. Any pictures of the Lady Gophers and Battle Annie? I didn’t find any. I’d love to see what she looked like though! I guess we have to imagine a very feminine but tough looking broad, will rip you off as easily as she pretends to kiss you…To her you might not lose your wallet it’s your life that’s at stake. I’m trying to find out what my grandfathers crime was when he was with the Hudson Dusters. I know he went to Elmira State Reformatory Seventh Ward in 1930. His name is Louis Dragicevich and his date of birthday is March 29 1911. Is there anyway you can help me find out why he was there. What was his crime?